Please help us keep the performing arts alive and well in our community. 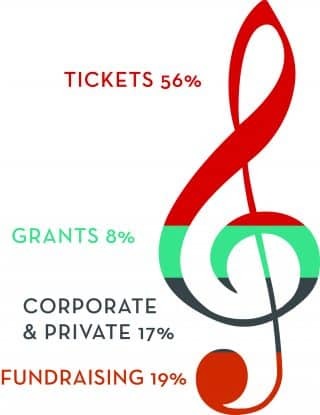 Ticket sales account for only 56% of our income, with the rest coming from corporate and private donors like you. Your tax-deductible contribution has the power to enrich lives and inspire thousands of YES! (Youth Experiencing Symphony) Program students each year. Click here to download the Show Your Support Flyer. *At the post-concert receptions you’ll enjoy meeting and performers, conductors and other Society contributors. Contributions received after the concert program goes to press will be recognized in the concert inserts. We need your help to keep classical music, opera and dance alive and well in Daytona Beach. Ticket sales account of only 56% of our income. The rest comes from corporate and private support, grants and “grassroots” contributions. Concert sponsorships are tax-deductible and are customized to your wishes and interests. The sponsorships, according to level, include advertising in the season program book, concert inserts and website; on stage recognition; receptions and photos with the performers and much more. For information about making a commitment to great music, please contact Christine Gerhardt 386.253.2901 or [email protected]. The Symphony Society supports an array of community outreach programs . . .from giving over 8,000 local students an introduction to classical music each year . . . to offering families, seniors and persons with special needs reduced prices to experience the power of 100 world-class musicians playing their hearts out on stage. It also encourages young “rising stars” with music scholarships and recital opportunities. The mission of the Daytona Beach Symphony Society Endowment is to promote the greater Daytona Beach/Halifax community and enhance the quality of life for all of its citizens, and provide permanent support to the Daytona Beach Symphony Society. There are many ways to make a charitable gift with insurance policies or trusts. With a relatively modest investment, a donor can make a substantial gift and receive tax benefits as well. You can name the Daytona Beach Symphony Society Endowment as the partial or contingency beneficiary of your retirement or pension plan. One of the most popular and easiest ways to make a planned gift is through your will. You can leave a specific percentage, dollar amount, property or the residual of an estate to the Daytona Beach Symphony Society Endowment. This provision can be part of a new will or added to your existing will as a codicil. Certain charitable gifts can provide you with a lifetime income with the remainder going to charity. These options ensure an income for you and/or your beneficiaries and then leaves a residual gift to the Daytona Beach Symphony Society Endowment. With this option, you have the benefits of stability, simplicity and flexibility. A gift to the Endowment provides donors to make significant, long-lasting improvements in the quality of life for the people in our community. For information about the Endowment and its services, please contact Christine Gerhardt 386.253.2901 or [email protected].